Instantly recognisable, this imposing species has many uses and is an important part of Brazil’s Atlantic coastal forests, but severe deforestation throughout the 20th Century has left it Critically Endangered. It is one of Brazil’s most threatened trees. The Araucaria Moist Forests of south-eastern Brazil, Paraguay and northern Argentina are an unusual and ecologically important mosaic of ‘Atlantic Forest’ species and relict coniferous forest. 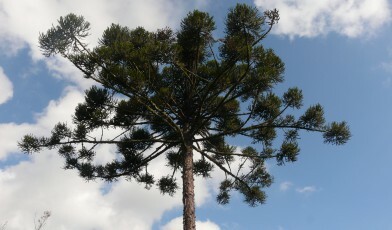 Araucaria angustifolia is the principal species in this ecoregion, with individuals regularly emerging from the canopy at heights of 45 metres or more. Adult Paraná pines are distinctive, with a bare, columnar trunk, crowned with a flattened layer of whorled branches. The clusters of needle-like leaves at the ends of these branches gave rise to the species’ other common name, the candelabra tree. Like its close relatives, the monkey puzzle tree (A. araucana) and the Bunya pine (A. bidwillii), the Paraná pine is culturally significant. Early explorers in the region reported its seeds’ importance as a food source to the Taquara-Itararé people. The seeds, known as ‘pinhões’ remain an important local food source today, with 3,400 tonnes collected each year. Other parts of the tree are also utilised for example, preparations of the tree’s leaves, bark and resin are used in traditional medicine to treat a range of ailments including rheumatism, anaemia, open wounds and sexually transmitted infections. Pinhões, roasted, are a popular winter snack in south Brazil. The Paraná pine is also been valued as Brazil’s ‘most important timber tree’ since the 1500s, but this has caused devastating deforestation. In three tree generations from the beginning of the twentieth century, 97% of A. angustifolia’s original territory was lost to unsustainable commercial logging, encroaching agriculture and timber plantations (of non-native species). Because of this, the species’ conservation status was upgraded from Vulnerable to Critically Endangered in 2006. Recognising the plight of the Paraná pine, the Brazilian government banned exports of its timber in 2001 and included it on a list of the country’s threatened species. The species is also afforded a degree of protection from botanic gardens and aboreta; according to the Global Survey of Ex situ Conifer Collections, the Paraná Pine is present in 89 ex situ collections worldwide. With its local partner Sociedade Chauá, the Global Trees Campaign is working to conserve the Araucaria Moist Forests, producing seedlings of threatened species (including A. angustifolia) to eventually plant in the forests and enrich the eroded diversity within this habitat. However, unless more forest areas are included in official reserves and parks, to protect them in the wild from deforestation and over-exploitation, their future remains in grave danger. In the UK, this species is proving hardy at Bedgebury National Pinetum, despite the difference in temperature to its native Brazil. This tree profile was researched and written by Oliver Wilson. Iriarte, J. & Behling, H. (2007) The expansion of Araucaria forest in the southern Brazilian highlands during the last 4000 years and its implications for the development of the Taquara/Itararé tradition. 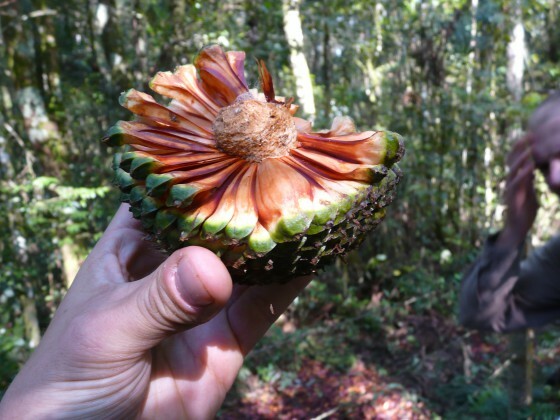 Environmental Archaeology 12: 2, p. 115-127 https://ore.exeter.ac.uk/repository/bitstream/handle/10036/27432/Araucaria%20forest.pdf?s..
All Brazil nuts eaten around the world are collected from threatened wild trees.